Text Ottawa’s boom 99.7 on 99799. 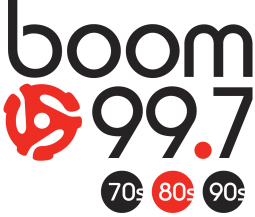 Ottawa’s boom 99.7 [CJOT-FM] has hooked up a new mobile messaging service. To text the station, simply send your messages to the station’s new text number 99-7-99. The messaging service will permit audiences to engage with shows, through live DJ chat, and offer an instant opt in channel for on-air contests and interactive music services. Text Toronto’s the Edge on 102102. TXT2WIN Eminem & Rihanna Tix. Ottawa’s JUMP FM is giving fans a chance to see Eminem and Rihanna on their Monster Tour at the Met Life Stadium in New York. 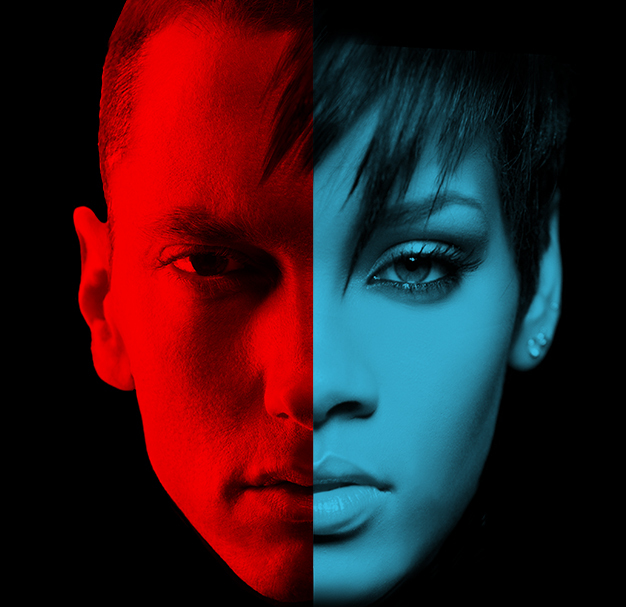 Starting Friday August 1 at 4pm ET; whenever you hear an Eminem or Rihanna song play on JUMP! – text the word MONSTER to 586736 from your mobile. The winner plus a friend will be flown by the station to New York for 3 days and nights at The Lexington in the heart of Manhattan’s East side. Round trip airfares are included and of course; 2 floor seats to the show! Standard texting rates may apply to enter – typical rate you text a mate. TXT2WIN Mötley Crüe Tour Tix. Southern Ontario’s best rock station, HTZ-FM, is giving rock fans a chance to win tickets to see Mötley Crüe in Toronto for the bands FINAL TOUR EVER! Enter on your mobile by texting the keyword MOTLEY to 977977 and receive automatic entry. This prize includes a pair of tickets to the show on August 10th at the Molson Canadian Amphitheatre! PLUS a Mötley Crüe Schecter Bass guitar! Competition lines are open on all Canadian mobile networks. Lines close sharp on August 3rd, 2014 @ 11:59pm ET. Standard network rates may apply – the typical rate you text a mate! Ottawa’s JUMP! 106.9 has launched the JT, You and Your Crew text to win contest. Up for grabs are 4 premium seat tickets to see Justin Timberlake live at the Canadian Tire Centre on July 22nd. JUMP! 106.9 will also get you and your crew there and back in a limo – PLUS – dinner before the show! For your chance to participate: simply text JT to 586736, when you hear a Justin Timberlake song play on air. Competition lines and contest will close sharp on Sunday, July 20th, 23:59 ET. Standard text rates may apply – typical rate you text a mate. Niagara’s EZ Rock 105.7 and Kavar Jewellers are giving listeners the chance to win 4 tickets to see One Direction in concert this summer. To enter is simple. Between June 12th & 26th, every time you hear a One Direction song on 105.7 EZ Rock, text SUMMER followed by your name to 10570 and you’ll be automatically entered. The winner will be called on-air with Rick Hodge and Lori Love between 5:30am – 8:59am on Monday, June 30th, 2014. Competition is available on all Canadian mobile networks. Lines close on June 26th Noon ET. Participants must be at least 18 years of age. Standard SMS rates may apply. Send STOP to unsubscribe. Win Soundgarden & NIN Tickets. London rock station HTZ-FM 97.7 is giving away the complete Soundgarden Discography – plus – tickets to see them in concert with Nine Inch Nails on July 27th at the Molson Canadian Amphitheater. To enter this competition: Text SUPERUNKNOWN followed by your name to 977-977. Calls may cost your standard rate – same rate as texting a mate. Lines are open on all Canadian mobile networks until midnight ET on June 16th. VIRGIN Radio Toronto is giving you the chance to win tickets to EVERY show this Summer.The biggest names: Katy, Gaga, Bruno, Jay Z and Beyonce and more. Over Twenty Shows. Over Forty Tickets. Winner takes all. To participate simply text WINNER TAKES ALL to 99999. Standard text rates may apply – same rate as texting a mate. Competition lines are open on all Canadian mobile phone networks. This week London’s BX93 is giving you the chance to win: Four General Admission Passes to BX93 Presents: Rock the Park Gone Country in Harris Park on July 23rd! Just text the word WIN and your name to 939393 between 6am and 5pm up to 50 times per number. If you are a potential winner, we will send you a text or give you a call to tell you all the details about claiming your prize. Happy Texting! Canadian standard texting rates may apply. The Molson Canadian Amphitheater is Canada’s ultimate venue to experience the best in country music. London’s BX93 is giving its loyal fans a chance to win their way to there with the 2014 COUNTRY MEGATICKET contest. Country fans across Canada can text in to win for a chance to see Paisley, McGraw, Aldean, Miranda and Rascal Flatts. For an automatic ballot entry – simply text the code word MEGA – followed by your first and last name – to 93-93-93 at anytime between April 23rd – 27th. The MEGATICKET winner will be announced on the Dave & Rachel Show on April 29th. The MEGATICKET competition line is available on all Canadian mobile networks – your agreed network standard rates may apply – same call rate as texting a friend. Tune in to CJAY 92, when you hear Kings Of Leon play, text the keyword: KOL followed by your name to the text number: 92=92=92 and every weekday morning, The Gerry Forbes Show will randomly call a texter with tickets to see Kings Of Leon at the Dome, starting with Row 12 and ending with the FRONT ROW on April1 st! Winner of the FRONT ROW tickets will also win a MEET N’ GREET with the band, one set of Klipsch Overear Headphones and a Vinyl copy of Mechanical Bull. Your standard text rates may apply to enter. Paul McCartney Classic Rock Road Trip! What do you get when you take a Beatle and put him in Beantown? 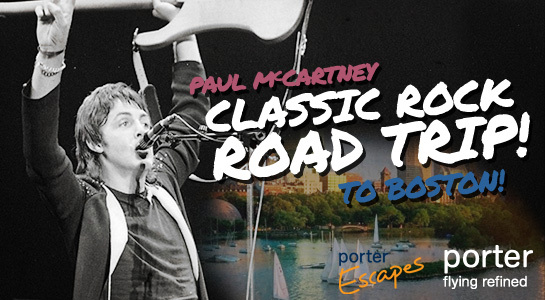 You get part one of the Paul McCartney Classic Rock Roadtrip in Boston! Sir Paul rocks Boston on July 9th and you could be right there with your best friend, courtesy of Toronto radio station Q107 (the Mighty Q) and Porter Airlines! Here’s what you gotta do! Every weekday, tune in to hear Derringer In The Morning announce the Paul McCartney Song of the Day. When we play it, get out your phone and text the song title to 107-777*! You could win a remastered Wings Over America release and Rockshow DVD! But the best part is that you’ll be on the short list to win the grand prize trip to Boston! You’ll fly with Porter Airlines from downtown Toronto’s island airport, and stay at the Boston Harbour Hotel, courtesy of Porter Escapes! So keep it locked to Q107, and get your texting thumbs in shape! The Contest entry period commences at 6:00 a.m. Eastern Time (“ET”) on May 27, 2013 and concludes at 11:59 p.m. ET on June 21, 2013. *Your mobile carrier’s standard text messaging call rates may apply. Text 2 Win MEGADETH tickets. On Feb 20th 2012; the legendary Megadeth will perform their Gigantour at Abbotsford Entertainment & Sports Centre. Also headlining will be; monsters of rock legends Motörhead; Volbeat and Lacuna Coil. For your chance to win two tickets to the gig: Text MEGADETH t0 104040 for an automatic ballot entry into the draw. A $0.50 network fee applies for each text entry. Mobile contest ends Feb 12th, 2012, 11:59pm PT. Winners announced on TEAM Radio 1040 AM. Text 2 Win: Slayer and Rob Zombie Tickets. The kings of thrash – Slayer – and Rob Zombie are back in action with their Hell on Earth tour. The tour hits Vancouver on August 3rd, 2011 and the folks at TEAM Radio are giving away a pair of VIP tickets to the event. For a chance to win tickets (PLUS a backstage meet and greet) text message the word ZOMBIE to 104040. $0.50 per text message entry. Power 97 presents Rock on the Range, August 20th at Canad Inns Stadium! For a chance to win VIP tickets: simply text the keyword RANGER into 212223. ($0.50 per text). Once you have texted in – tune in to Winnipeg’s best rock station – Power 97 – and listen out for Rock on the Range winners – we could be calling your mobile! Text 2 Win: Roger Daltrey Tour Tickets. On October 27th 2011, at Rogers Arena – Vancouver, Roger Daltrey will be performing Tommy live on stage. TEAM Radio is giving its listeners a chance to win tickets to see Roger perform hit tunes such as “Pinball Wizard,” “The Acid Queen,” “I’m Free,” “See Me, Feel Me” and “We’re Not Gonna Take It” plus other Who favorites. For a chance to win simply text the word TOMMY to 104040 – a $0.50 network fee applies per text entry. Text 2 Win: See SOAD Rock Vancouver. Vancouver’s TEAM Radio is giving listeners more chances to win tickets to see System of a Down perform live at Rogers Arena on May 12th. For a chance to win tickets: text SYSTEM to 104040. A $0.50 network transit fee applies per text message entry. Text 2 Win: DJ TIËSTO VIP Tickets. Victoria’s 107.3 KOOL FM is giving listeners the chance to win VIP tickets to see legendary Dutch DJ TIËSTO. Winners will get access to a VIP box at the SOMC center in Victoria, BC. For a chance to win simply text message the code word DJ – followed by your name – to 54321. The winner will be declared on Facebook on May 1st, 2011. A network fee of $0.50 applies per SMS entry. Text 2 Win: STEREOS … @ UR High SKool. Juno Award – nominated band, STEREOS and Halifax’s #1 hit music station 101.3 the BOUNCE are giving high school students the chance to win a VIP stage performance at their school. For a chance to win a BOUNCE road show, students can text vote in there HIGH SCHOOL NAME to the Short Code 54321*. The high school accumulating the most SMS votes will win a live performance from STEREOS. The text vote line opens at 8.00 AM|ET on Monday April 11th and will close sharp at 8.30 PM|ET on April 22nd. *The vote is limited to participating Halifax municipal region schools – a current list of eligible schools can be found here. A $0.50 network fee applies per vote and the poll is capped at a maximum of 3 SMS votes per day per SMS user.